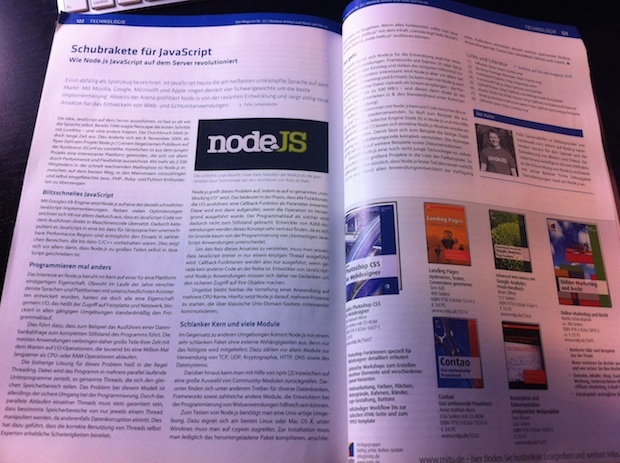 Last night I was giving a talk about node.js in production at the Berlinjs user group. In the talk I shared some of our experiences at Transloadit, but also tried to cover the topic from a general angle. I concluded that running node apps in production comes with certain challenges, most notably the lack of useful stack traces when things go wrong. But that's something Ryan is working on, and a little unit testing can go a long way to avoid most bugs : ). Der Artikel richtet sich vor allem an komplette Neulinge, eignet sich von daher aber super um mit dem noch ein oder anderen skeptischen Kollegen ins Gespräch zu kommen. Für alle die an einer kostenlosen Ausgabe des Heftes interessiert sind: Einfach den link re-tweeten und mir dann eine E-Mail schicken. Die ersten 3 tweets bekommen ein Exemplar per Post. Last night I had the honor of speaking about node.js in front of Berlin's ruby community at the @rug_b user group meetup. The meeting was well attended (~50 geeks), but wooga did a great job hosting the event and even let us use their main room after it became clear that we couldn't fit everybody in the initial room. The slides of my talk are available on slideshare and as a pdf download. For those of you who have seen the previous version of the talk, this is a very much updated version. Basically I had to replace all previous "The Future" slides with new content since node has implemented all of those things by now : ). Anyway, Tim and I had a great time talking to everybody and also enjoyed the other talks about Mongrel2 and Phusion Passenger 3. The last two days at JSConf.eu can only be described as epic. Thanks to holger, jan and malte the whole event was perfectly planned and executed. Node was in the air and managed to infiltrate a big part of the conference. But I also got a kick out of some of the fantastic frontend talks. Microsoft was hard at work trying to convince developers that IE9 is going to be the real deal, but Douglas Crockford seemed skeptical, getting into a bit of a fight with one of the Microsoft representative during his talk. The efforts they are putting into making canvas fast seem good, but I'm skeptical if they can finally deliver an all-around decent browser. Palm was showing of their new node-powered WebOS stuff, and if all works out I'll soon have a device which I'm looking forward to play with. Ryan gave a presentation on a few of the problems the node projects needs to overcome in the near future, and Jed pulled of one of the best presentations I've seen at a conference so far - I'm very much looking forward to playing with his new version of fab. I gave a talk about dirty, which is a tiny key-value store I've written in node.js, basically to test the waters for writing more serious databases with node. If you're interested in it, you can checkout the slides or download them directly. My brain is still somewhat damaged from partying until 5am last night, so the above list is missing a bunch of other people I really enjoyed meeting as well. And of course we were also spreading plenty of transloadit propaganda, resulting in tons of good feedback - some people really seemed to dig our little project : ). Anyway, if you weren't here - you should really keep your eyes open for the next JSConf.us which, depending on the volcano situation, I'll hopefully be at as well! PS: Please let me know if you have any questions about dirty, I'd be happy to answer them.